With Pyjamas through a whiff of grapeshot! : "He who hesitates is lost!" "Oh Saxe-Weimar where were you when I needed you most?" Phil and I finally managed to coincide our schedules and finally return to the fields of 1815 Belgium to conclude our game of General D'Armee. 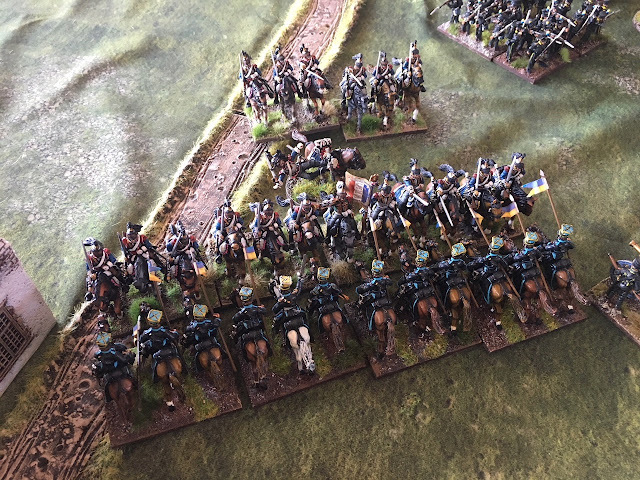 At the last report, the game was quite evenly poised with the Brunswick cavalry brigade holding on grimly against a brigade of veteran French Cuirassiers and the British brigades in the centre giving the French a bit of a spanking from some fire-fights. For your information GdA was written by David Brown, he of General De Brigade fame amongst many systems, and they are an absolutely cracking set of Napoleonic rules! The French in the centre await their fate. With all this awaiting them. The French Brigade has a unit disperse and then fails the Falter test and retires, taking the guns with them. French heavies may be a prudent tactical decision. ...and the Brave Black Brunswick Hussars luck finally runs out. However the French Heavy Cavalry Commander kept the pressure on and charged the Brunswick Uhlans. Whilst the Brunswick Horse artillery keep the other regiment of French at bay. fresh rear line troops from replacing the worn troops in the front. Sauve Qui Peut result forces major retirements. A massive hole in the allied left appears and the reserve Brunswick Brigade off table is nowhere to be seen. 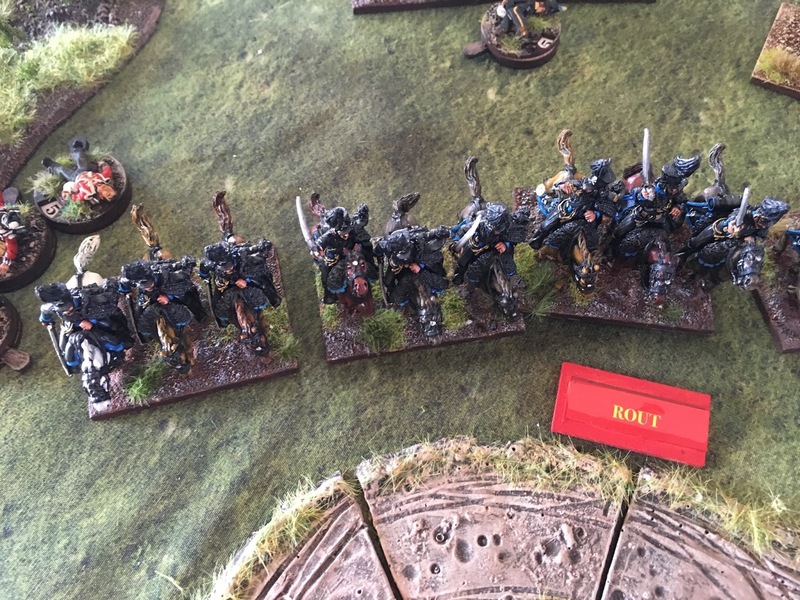 also hesitant in a series of disastrous command rolls for the good guys. effectiveness on the field. Those tissues look so, so wrong! light cavalry opponents in a battle for the hill. A differing view of the action. the French battery manhandles forward to take some shots at the now isolated brigade of Kempt. ...feeling pretty good about what they see before them. So the situation has changed dramatically in a few short turns. The allies have lost a brigade along with their valuable Aide De Camp. The British of Pack are in retreat and the lads are somewhat isolated up front and the Brunswick light brigade of infantry are pinned down by cuirassiers and heavy artillery pounding upon their squares. Splendid looking battle, Carlo! I like your deployed skirmish stands. Thank you very Jonathon and I’m glad you like the skirmish bases. I think I originally saw them based like this a few years ago with Roger Murrow of Murawski Miniatures fame and was quite taken by how good his looked. You're inspiring me to get a game in rather than to continue to paint Carlo! Thanks so much Kerry and let me assure you, if you were around the corner we’d be gaming every weekend! It is such a great gaming system and I am so enjoying the entire GdA feel to Napoleonic gaming. Attack, Braunschweig! The battle looks great! Thanks Serguiss - those Brunswickers may be in trouble though my friend. A spectacular table, sounds great! Thankyou very much Phil. Still working on a few additional pieces of terrain presently. I would say that it all looked very nice, but to a person with allied leanings it really doesn't look so nice at all! Perhaps the British, Dutch Belgians and Brunswickers need to send for Blucher and his "children" to once again pull their butts from the fire! A-ha-ha! Cheers Peter and yes, those Prussians would be mightily handy at this particular time let me assure you. If not the children arriving even a crotchety old Aunts assistance would be greatly appreciated. Very entertaining and exciting - must be the way you tell it! thanks. Thanks very much Chris as I always try and add some flavour with the narration. Battle reports always allows for more artistic flair than my standard work ones that’s for sure! I am very fortunate Stew to have a great wargames room upstairs and a wife who allowed me the expense of having such a luxury. Not only is it great to be able to leave it set up, it also acts as an incentive to finish all the other little things as you have seen in recent "Workbench" posts lately. A great looking game Carlo. Thank you Mark. Your wonderful GdA excel spreadsheet was a god send for me calculating lists etc. Have you updated it yet with Dave’s points amendments gore Brigadier General Quality? Very exciting to see the action unfold. The rule system certainly throws up some interesting conundrums for commanders and certainly seems to reflect a sense of realism. The detailed excel spreadsheet sounds useful? Loving your collection of figures Carlo! Like my own model figures I see you painted saxe weimar's uniform in green as there is a split in opinion on whether his uniform was blue. I have seen it blue in a watercolour painting some time ago........but I am still unsure and favoured green!. Cheers Kevin. The element of Command and Control is sensational in these rules. 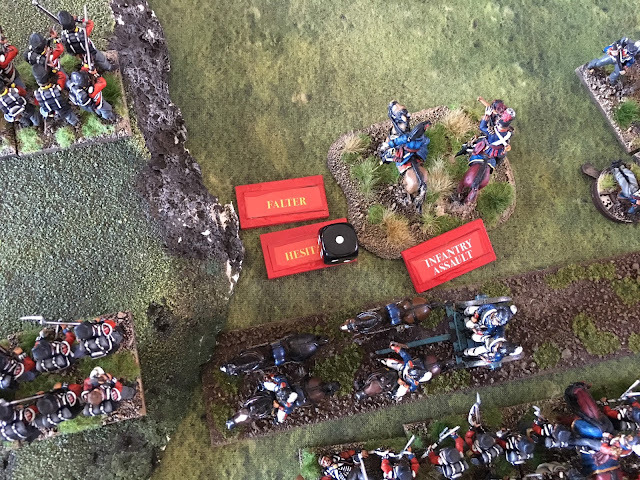 The British on the hill were poised to land a knockout blow but were hesitant a few turns in a row which allowed the French the time they needed. I have seen the watercolour you refer to of Saxe Weimar as well and then also have a wonderful picture of Jim in the uniform we have both gone with. I will email you a copy. Lovely looking game and figures, are the French going to turn it around? Thanks Iain for your kind words. The mat makes a world of difference in my opinion and now I just have to continue to build some more terrain pieces and mount the other buildings on 12’ x 12’ bases. Very nice rolling from you I assume...you English.....sheesh. Looks like a very lovely set up as usual. You assume correctly sir! Thanks Coln.